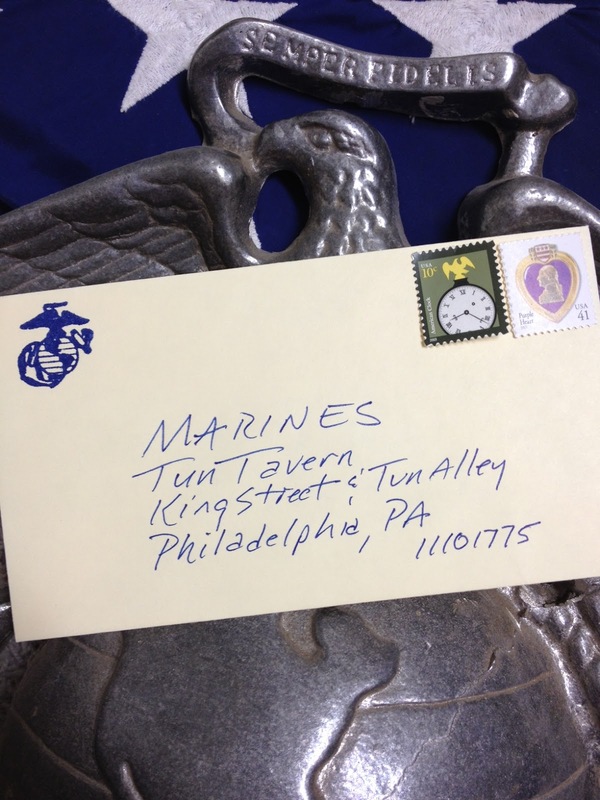 Today's comment was first published three years ago - marking the 237th Birthday of the United States Marine Corps. To all and especially the five other Marines of my first FMF "officers' club" - Golf Company, 2nd Battalion, Sixth Marines (G 2/6); Rick, Mike, Jim, Rick, and Harley (retired Marines all) - Happy Birthday, Marines: 240! Today's comment was conceived as a greeting card - to be prepared and delivered by what is seen by youth as the old-fashioned way. That is, sender sitting at their desk or table writes, in cursive, a thoughtful note, addresses the envelope, adds a return address, applies necessary postage - a stamp or three, then walks the piece out to the home mailbox and raises the flag, usually red, alerting the mailman (carrier probably the politically correct term) to outgoing mail. That routine is more familiar and comfortable to me than electrons. And I practice it regularly - typically several times a week. I send handwritten greetings because they are more intimate, more personal, can make someone's day, and they endure. And there's nothing quite like being on the receiving end of handwritten greetings from far away family and friends; though frequency is not what it once was - electrons are so much easier. Easier, and cheaper, is not always better. Though facing financial challenges, our U. S. Postal Service is rather remarkable - a letter or package can be sent from person-to-person - a few blocks away, across the country, or on the other side of the globe - with near absolute certainty of delivery, and at a reasonable cost. Sometimes the mail arrives a day or so late. And sometimes the mail arrives a day or so early - as is the case today (ironically, thanks to electrons). An impromptu encounter and time-passing idle chit chat with a stranger while standing in line at the post office a few weeks ago the impetus behind today's brief but heartfelt comment. At one point the woman said, "Oh, so after college you joined the Marines?" Her innocent question struck me as funny and so I chuckled while replying, "Well, yes, I guess you could say that." And then I was next to the counter with a box to ship to a Sailor I know serving in Afghanistan. Walking to the car, I thought about her question. No one joins the Marines. You join book clubs and garden clubs and bridge clubs and chess clubs and cooking clubs and scrapbooking clubs and Boosters clubs and so on. But no one joins the U. S. Marine Corps. It's just not that simple. There are a few hurdles to "joining" the Marine Corps club. First, recruiters or Officer Selection Officers, who just so happen to be Marines, scattered about the country - small towns to big cities - searching every nook and cranny for those men and women who may have the mettle, are the initial screeners. And that's no easy cut. If offered the opportunity to enlist, a prospect signs some papers, swears an oath of allegiance to country, and awaits government transportation to one of three beautiful resort Marine bases - Parris Island, SC; San Diego, CA; Quantico, VA - for further screening. At Parris Island and San Diego, recruit depots where enlisted Marines are made - eventually - demanding, impatient, perfectionist Marines fondly known as Drill Instructors, DIs, lead recruits through a rigorous 13-week training and transformation program. For sundry reasons, not all recruits make it. In Quantico, at Brown Field, where officers are made - eventually - Marines known as Platoon Sergeants and Sergeant Instructors, once DIs, lead candidates through even more rigorous training and transformation. For sundry reasons, not all candidates make it. Think of what goes on at the recruit depots and Brown Field as an unimaginable stress test - months long - of mental and physical strength and endurance; a comprehensive gut check of courage and character. That's why not all recruits and candidates make it. In short, and as it must be, seasoned enlisted Marines - NCOs and SNCOs (the DIs, Platoon Sergeants and Sergeant Instructors) - have a significant and critical role determining who gets to "join" our club. They are looking for the best - to be Marines and to lead Marines. Marine officers then put their stamp of approval on those deemed worthy by DIs, Platoon Sergeants and Sergeant Instructors. And only with that approval comes the title "Marine" and the privilege to wear the eagle, globe, and anchor - for life. That's the way it works. And has for generations of Marines. And, God-willing, will for generations of Marines to come. Today, 10 November, is an important day to Marines. It's our birthday - this year our 237th. And it so happened, the year of our founding - 1775 - our day of birth, in a pub named Tun Tavern in Philadelphia, Pennsylvania, fell on a Friday. So surely it's no coincidence that was the origin of "Happy Hour" at Enlisted, NCO, SNCO, and Officers' Clubs on Marine Bases worldwide - late Friday afternoon, a time for cheer and camaraderie, sometimes rowdy and 'Marines will be Marines' fun beyond description and surely nothing to discuss in mixed company. "Mixed" not implying gender but Marines and all others. Today's the day. What I'd give to be at the O'Club at a Marine Division this afternoon (at least as it was back in my lieutenant and captain days) - after all, I am an infantryman. Aviators take the merrymaking to another level - two of my brothers are naval aviators, one a Marine and Sailor the other Coastie - and I am thankful to have survived the experience(s) at O'Clubs aboard air stations. How to explain being a Marine to someone who is not? For 33 years I have failed miserably, as surely all Marines have, but not for want of trying. For some insight I offer a link to a short clip about Marines. As best I can recall, it dates back at least 30 years. Since, there have been some terrific visual ads, programs, and messages celebrating Marines but none of them equal 'Such as Regiments Hand Down Forever' - the haunting music, the thoughtful narration, the powerful imagery of our culture and the horror of war perfectly complement and say "Marine." After all these years, a chill and well of pride whenever watching. 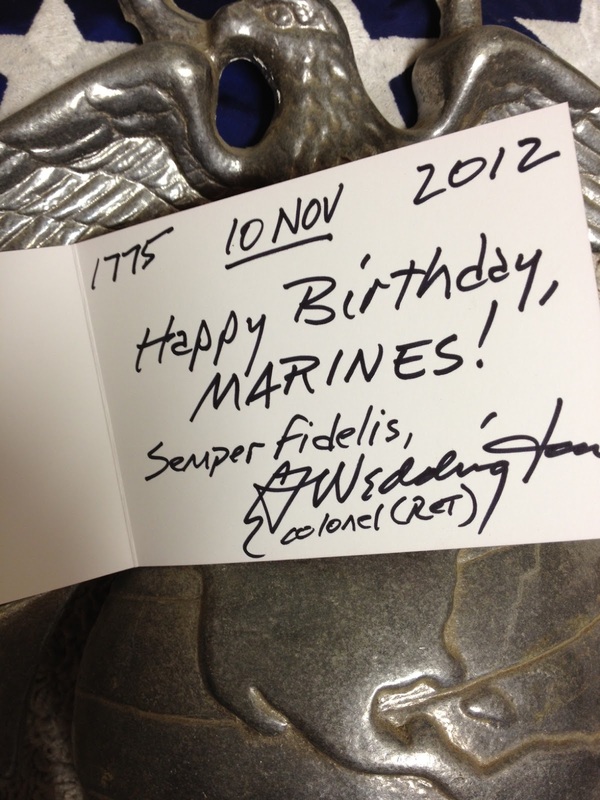 If fortunate to know a Marine - wish them "Happy Birthday" and thank them for service to Country and Corps. Few have made such selfless sacrifices. Few ever will. My regret is not being able to send a handwritten birthday greeting, via the U.S. 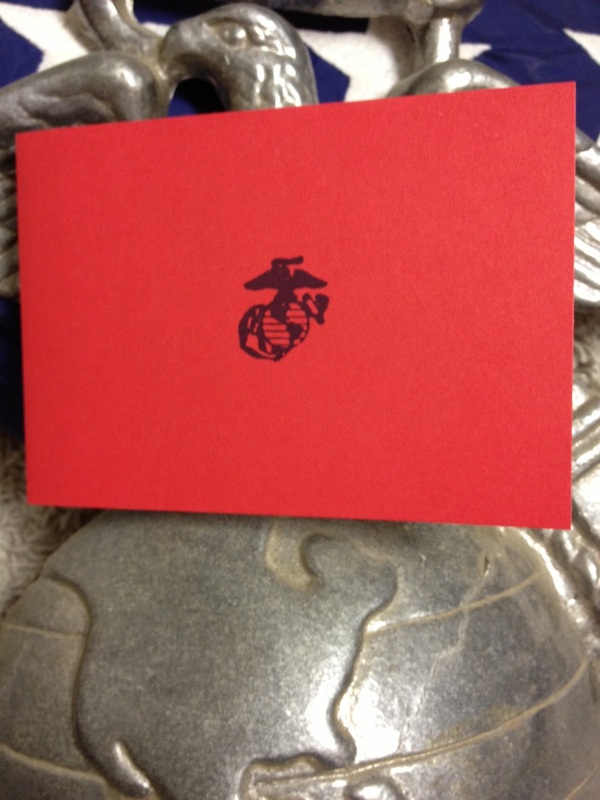 Postal Service, to every Marine I know - private to general - and to all Marines. So, through the wonders of technology, the next best thing. I could go on and on about Marines but it's time to seal the envelope and mail. Greetings to you, Marines, Happy Birthday! Semper Fidelis. 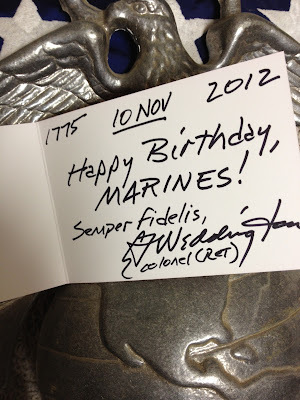 Permission granted, to all, to re-post this Birthday message and, by all means, pass to Marines - a rare breed of a club I'm privileged, honored, and humbled to have been deemed worthy to "join" - first screened by Captain Florence (Officer Selection Officer) and Staff Sergeant Tucker (Officer Selection Officer administrator) then deemed so by Gunnery Sergeant Cooke (Platoon Sergeant) and Staff Sergeant Hardison (Sergeant Instructor) and stamp of approval by Captain Phofl (Platoon Commander). And those five Marines were only the beginning. And as for Marines, the terms "ex" and "former" are taboo. Marines are - 1) Active; 2) Reserve; 3) Retired; 4) Not in a duty status; 5) Dead. They are the finest men and women I know. Therefore, today's commentary addressed to all of the above - Marines. I kindly ask all readers to help with delivery. Thank you. Though it goes without saying, Marine families, too, are a rare breed. In that light, my hope is this commentary somehow reaches a family by the name of Hurst - believed still in West Virginia. Their son was a recruit - he did not complete recruit training at Parris Island. He died, of natural causes, Saturday morning, 01 October 1983 - barely a month into training and transformation. He was seventeen. Not a day has passed since that he's not crossed my mind. His untimely death was a reminder to a young first lieutenant, his Series Commander, me, that God indeed works in mysterious ways. How fitting Heaven's gates, as noted in the Marines' Hymn, are guarded by Marines. Update: 10 November 2014: Thanks to a diligent reader who tracked down the Hurst family, 'Making Marines', their copy delivered a few months ago. Happy Birthday to you too, Colonel.